Are you constantly getting notifications on your wordpress blog that you have received a trackback or pingback? Are you unsure about whether to approve them or trash them or spam them? In this article I will attempt to explain what trackbacks and pingbacks are, and point out that in the majority of cases they are used for spam so the best option is to turn them off. Most blogs allow visitors to leave comments. There are also ways for authors of other blogs to leave comments without even visiting the blog called “pingbacks” or “trackbacks”, which can inform other bloggers whenever they cite an article from another site in their own articles. Trackbacks and Pingbacks are basically notifications you get from WordPress (and other similar blogging platforms) when someone links to a post on your blog. TrackBacks were designed to provide a method of notification between websites. It is a way to notify a website when you publish an entry that references it. Pingbacks were designed to solve some of the problems that people saw with trackbacks. The best way to think about pingbacks is as remote comments. When you link to another persons post, your pingback appears in their comment section just as any other comment would. As to whether your pingback gets published is determined on that persons comment settings (eg. whether they allow comments to published immediately or await moderation). The danger of allowing comments (and therefore pingbacks) to be published immediately on your own wordpress site, is that it makes it very easy for spammers to create instant links with your site. This of course is not a good thing for your readers, and search engines don’t look upon it favorably either, as these links quite often point to sites that are infected with viruses and malware. So what does this all mean in real life? Well, usually, a lot of spam. While it might seem like a good idea to build links between sites with related content (especially for search engine optimization), the reality is that the most common use of pingbacks is for spam. Therefore, my general recommendation is to turn them off unless you are prepared to spend time sorting through all the spam pingbacks to find the occasional legitimate one. 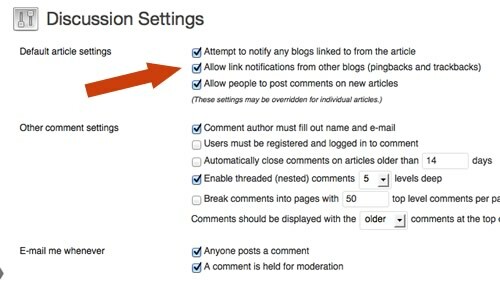 To turn off trackbacks and pingbacks in WordPress, in the Dashboard go to Settings -> Discussion -> Default article settings. Uncheck the box for “Allow link notifications from other blogs (pingbacks and trackbacks.)”. See image below.